In some cases, after disappearing the input signal and its further recovery, you may need to force the software restart of the capture channel. The reason is that the capture device continues capturing the "black burst" frames after the recovery of the input signal and you may need forced reinitialization of the device for resumption of receiving. The problem has been noticed at boards by BlackMagic Design, StreamLabs, when receiving SDI and at Ethernet-interfaces that receive transport streams. SL NEO platform software allows automatic tracking the input signal, detecting the "black burst" frames and automatic restart of software on the current channel in case, if the duration of capturing the "black burst" exceeds the set value. To activate this function, you should adjust an appropriate rule (Action) for every capture channel. The procedure of adjusting the rule is implemented from the control web-console of the server: menu section Manage, item Video IO Boards. 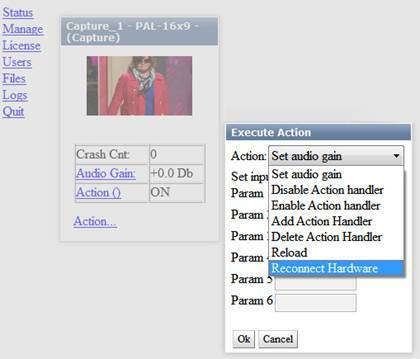 Choose the item No actions Defined in the appropriate window of the capture service (Capture), then press Edit. 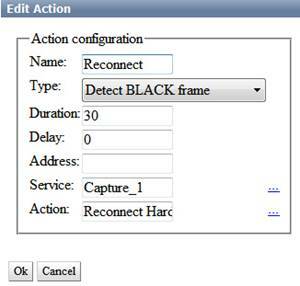 Choose Add Action in the opened window Edit Action, enter the random name for the rule into the fieldName, choose the type of analysis Detect Black frame in the field Type. Find the field Duration and define the time value in seconds. The parameter means the following: if the black burst signal is being permanently detected, the rule will be executed after the set time. In the field Delay you can specify the time value for delay of the start of executing the rule. In the field Service press the button … and choose from the list the name of the service for control. In our case it's the capture channel #1 (Capture_1 in the list). In the field Action choose the command that will be executed in the current rule - Reconnect Hardware. To save the settings, press Apply Changes at the top part of the server control console. The configured capture service will be reloaded. The same way is used for adjusting rules for a few capture channels. You can control execution of rules in the windows for viewing messages, that may be activated by the right click on the icon SL NEO Media Server in the Windows tray: Messages - Capture_1. For the manual restart of a capture service, you should use the command Action - Reconnect Hardware at the appropriate icon in the menu section Status of the server control web-console.